As I mentioned the other day, we made some wooden puzzles to flummox our family with on Thanksgiving Day. 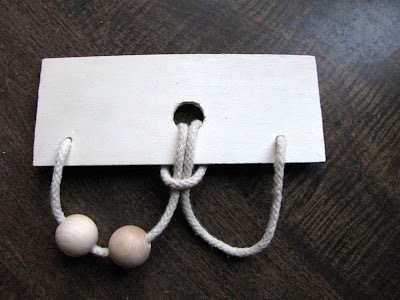 This first one can be made with paper or cardboard (such as a cereal box) - just use something stiff and fold it so that it's as sturdy as possible. The size doesn't really matter, six to eight inches by two or three will do. Punch holes near the outside corners, then make a larger hole in the center - but not large enough for your beads to pass through. 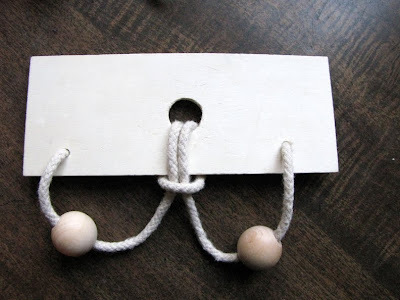 Make your string long enough that there is slack and room to pull. Tie or your string on like this. Challenge: To get both beads on the same side of the board. 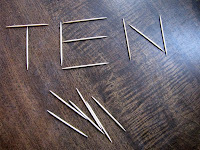 Arrange twelve toothpicks like this. 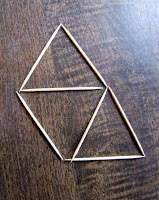 Challenge: Create three triangles our of this shape, moving only four of the toothpicks. 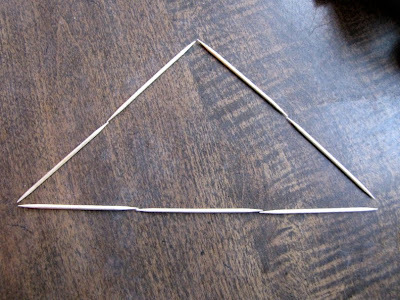 Arrange seven toothpicks into a triangle like this. 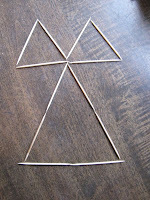 Challenge: Create three connected triangles moving three toothpicks. 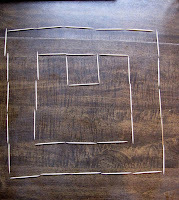 Arrange fifteen toothpicks like this. 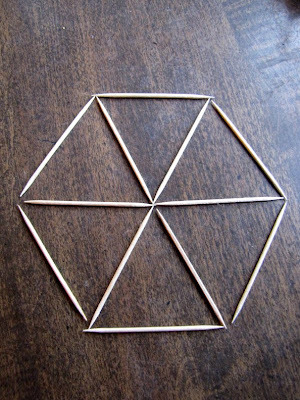 Challenge: Remove six toothpicks and still leave ten. 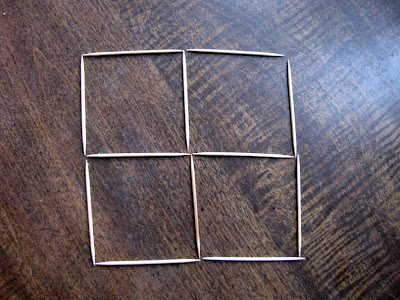 Arrange twelve toothpicks in four connected squares like this. 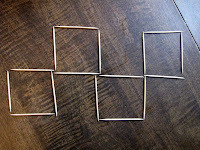 Challenge: Create three squares moving only three toothpicks. Arrange a spiral like this. 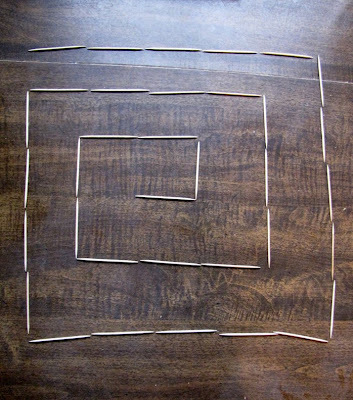 Challenge: Make three squares moving four toothpicks. It's a good idea to at least try to solve the problems first, so that you might have a greater appreciation for their complexity. 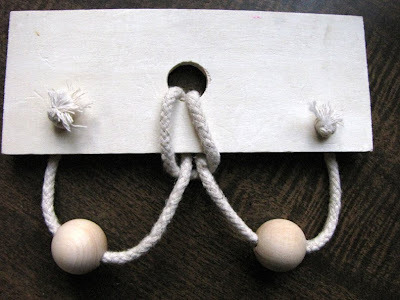 String and Bead Puzzler: Assuming the front of the puzzle is where the loop is visible, pull the loop down, and push the bead on the right through the central loop and into the middle. Pull on the two strings closest to the middle hole, until you pull the loop up through the hole. You'll now see two new loops, and pass the bead through these loops. Pull the two new loops back through the center hole, then slide the bead through the original loop and onto the left loop. Love this! 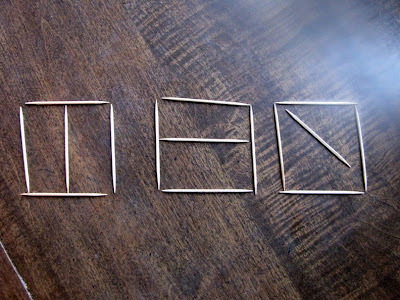 We will be challenging the family on Thanksgiving day with the toothpicks! Thanks! Stephanie, thank you so much for inspiration and thoughtfulness and a sense of piece every day. I look forward to reading about your life and family each morning. LFM - Thank yo so much. I'm deeply touched by your sweet words.